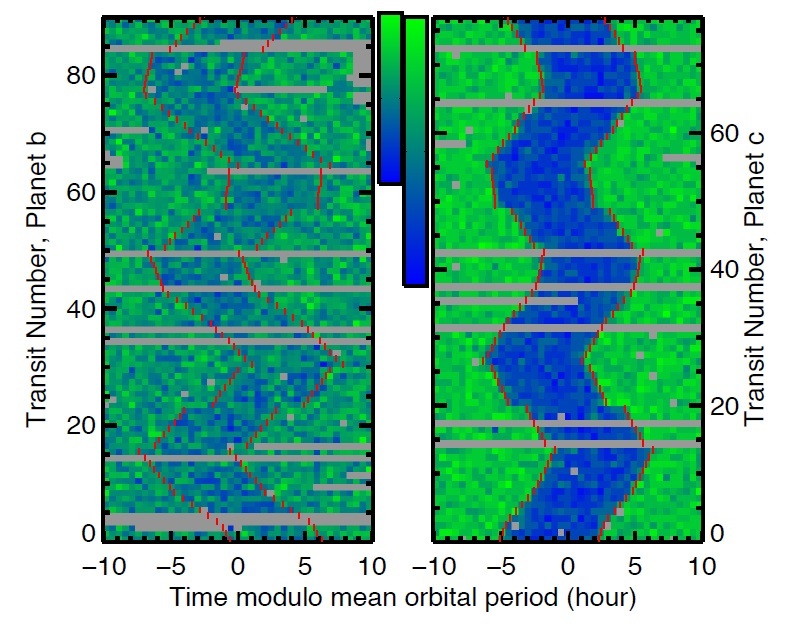 The future of planet hunting: finding rivers in a marsh – Science Calling! NASA’s Kepler satellite is on a roll. Since it was launched in 2009, it has found over 2,000 potential planets around other stars, or exoplanets. Its method is as simple as it is powerful: it constantly monitors over 100,000 stars in a single patch of sky, its telescopic eye waiting for planets to reveal themselves by crossing in front of its star, an event known as a transit. By blocking some of the light reaching Earth, the star appears to be temporarily dimmed—repeatedly, each time the planet completes an orbit around its star. But what else can Kepler tell us about these planets? It turns out that one of the most powerful ways to learn about a planet’s character is one we often deploy on our fellow humans: whether or not they’re on time. That’s right—planets can run late (and early) too. Instead of their transits appearing at perfectly clockwork intervals, the planets may make their appearances in front of their star as much as 20 minutes too early or too late. This is because when multiple planets orbit the same star, they also exert their own gravitational pulls on each other, jostling and tugging on their fellow planets. Thus, each planet’s arrival can be delayed or expedited by the influence of the others. The result is that they intercept the star’s Earth-bound light not with clockwork regularity but on a sinuous, shifting schedule that meanders in time. These are known as transit timing variations, or TTVs for short, and they can even allow astronomers to detect “invisible” planets that don’t transit their stars—if one planet is being delayed, they know it’s because of the influence of another. Josh Carter, an astronomer at the Harvard-Smithsonian Centre for Astrophysics, likes to think of TTVs as rivers, as he outlined in a talk at Boston University last month. This analogy is made clear in Carter’s unique visualization of the TTVs for a pair of planets in a system he co-discovered known as Kepler-36. Unpublished version of the plot that is updated with the most recent data. Courtesy of Dr Josh Carter (with permission). Click to enlarge! There are two plots here—one for each planet. To read them, keep in mind that each row of pixels represents one orbit, and the color of each pixel corresponds to its brightness. In each row, the star’s normal brightness is indicated by the green pixels; the transit and its diminished light is indicated in blue. Reading this plot chronologically from bottom to top, you can see the timing of the transit in each successive orbit, shifting back and forth in time, carving out a river of blue. But smaller planets cast smaller shadows and produce transits that are harder to detect. The right half of the plot corresponds to the planet Kepler-36c, eight times as massive as Earth. As Carter says, it sticks out like water rushing through deep river gorge. The left half shows the river of the smaller planet Kepler-36b. Even though it’s still four times the size of Earth, it’s much less visible. Measuring the TTVs of these smaller planets is like “trying to find a river in a marsh,” says Carter. The reward is well worth it, however. A shortcoming of simple transit analysis is that you can only measure the size of the planet that’s casting the shadow. But because the TTVs depend on the size of the gravitational forces the planets exert on each other, Carter was able to determine the masses of the planets as well. This information is crucial, as it helps astronomers distinguish whether discovered planets are gas giants or rocky, like Earth—and potentially habitable. With Kepler continuing to grab headlines with discoveries of smaller and smaller planets, the team appear to be zeroing in on finding a true second Earth. If (or when) that discovery comes, TTVs may well turn out to be crucial in identifying it. For a visualization of one of Carter’s computer simulations he uses to determine the masses of the planets, click here.